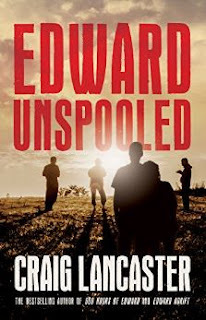 Edward Unspooled is Craig Lancaster's latest "Edward Stanton" novel. It follows on from the events of 600 hours of Edward, reviewed here and Edward Adrift, reviewed here. It's funny because I really wanted more after 600 hours but felt closure after Edward Adrift. I didn't think there was much left to write about. How wrong I was. Edward Unspooled is easily the best of the three. Edward Unspooled is one of the most enjoyable books I've ever read - and for that reason, I read it very, very slowly trying to enjoy every nuance of it. I've only finished it now because I've gotten a backlog of other books to review. You don't have to have read the other Edward books before reading this one but I think it probably helps. This time, the pacing is a lot tighter. Craig has dispensed with the weather reports and added a female voice to the mix. It makes things far more dynamic and personal. One of the things that I'm always talking about on this blog is "letter writing to your partner". (See: Letter Writing in Relationships Part 1, Part 2 and Part 3 and Marriage Encounters Part 1, Part 2, Part 3, and Part 4). If you have Asperger's syndrome, particularly if you're a "writer-type aspie" like I am, this is one of the most critical tools to have in your relationship arsenel. Without giving too much away, Edward Unspooled takes the form of a co-written diary in which a couple talk about marriage issues during a period of significant change. There's a lot going on and given that people with Asperger's syndrome don't always handle change well, there's a lot to disucss. Edward is a masterclass in Asperger's relationship letter writing and it's a great story with enough unexpected twists and turns and a shocking moment or two to keep you hooked. Like all the Edward books, there are no car chases, no murders, no spaceships. It's all about family and about Asperger's syndrome but mostly this time, it's about relationships. It's about give and take, about change, compromise and forgiveness. Edward Unspooled is available from Amazon as a kindle eBook, Goodreads as a paperback and there's an audio book version available from Audible. I honestly can't praise this book enough. Just get it. I'm now planning to read one of Craig's other books; The Fallow Season of Hugo Hunter, and if you've read Edward, you'll know why. Honesty Clause: I was not provided with a review copy of this book. I simply bought it and read it because the others were so good.